Every once in a while I come across a Post Secrets that really,really strikes home. This one did just that. 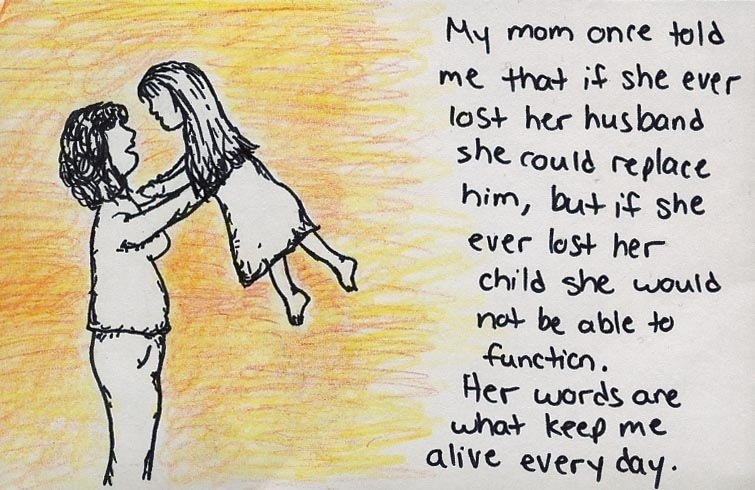 I remember the first weeks home without Evan and the pain…I remember the vacant stare on my aunt’s face at my 14 year old cousins funeral…The pain of outliving your child is almost unbearable and is the finest line you will ever walk between sanity and insanity. Posted on June 11, 2012, in Blogging, Infant Loss, Parenting, Social, Spirituality, Stillbirth and tagged child loss, death of loved ones, life after, sorrow. Bookmark the permalink. 4 Comments. That is a profoundly moving piece. Thank you so much for sharing it, and the feelings and memories it evoked in you. I honestly feel like I couldn’t have coped with the loss of our daughter without my fiance buy my side. I am so grateful for his presence, and I know that he relies on my support as much as I rely on his. I don’t know if I would take the deal if I were offered to swap one loss for the other. Would I be able to care for my newborn baby while trying to cope with the loss of my best friend, partner, lover, greatest supporter? I agree, in terms of my husband was my greatest supported during the time of our loss…and so do I agree I would hate to have to make a choice between the two. That being said, my husband and I both mutually agreed that we would rather loose each other in a heartbeat then go through another stillbirth like we did, or God forbid loose Evangeline. The idea of loosing my hubby is still horrific though, I just hope and pray it never comes down to that and we can continue being a happy family.